A small metal table becomes a fountain by swapping the glass top for a plastic planter bowl and dressing up both pieces with spray paint. A submersible pump and attached fountain bring the waterworks to life. Glass balls glisten under the water and conceal the pump. Tip: Replenish water as it evaporates, keeping the pump submerged to ensure it works properly. 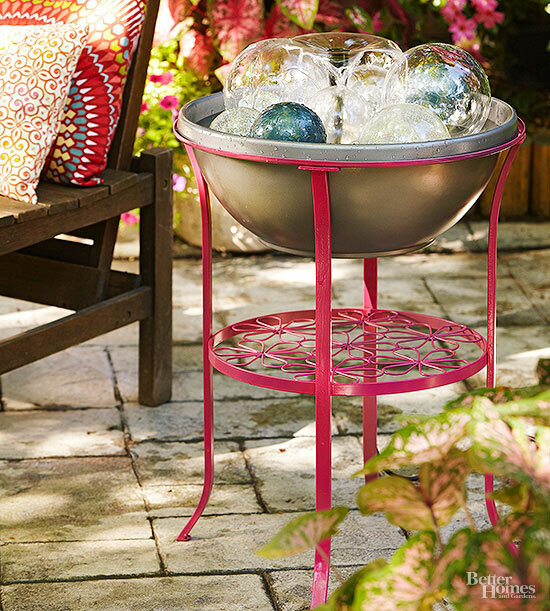 Stir up some fun by mixing concrete and adding color. 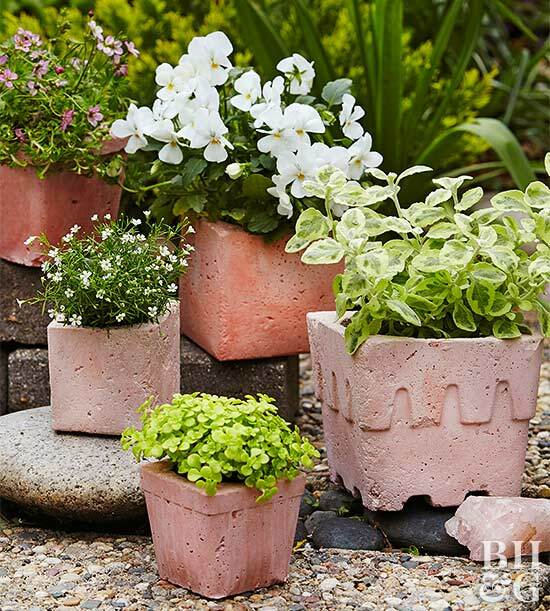 These custom garden pots were created using small disposable milk cartons for the exterior designs and tumblers from the dollar store as inner molds. 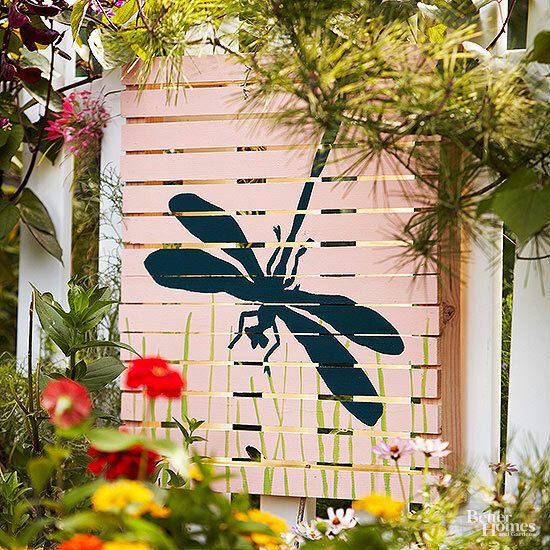 An unadorned stretch of fence becomes a fetching focal point thanks to colorful stenciled outdoor artwork. This woodencanvas was created using a bundle of lath, available at a building center. After constructing your palletlike canvas, roll outdoor acrylic paint onto the front. Position your stencil on the lath canvas using repositionable adhesive, then paint the image with a flat brush. Let dry before attaching to a fence or wall. 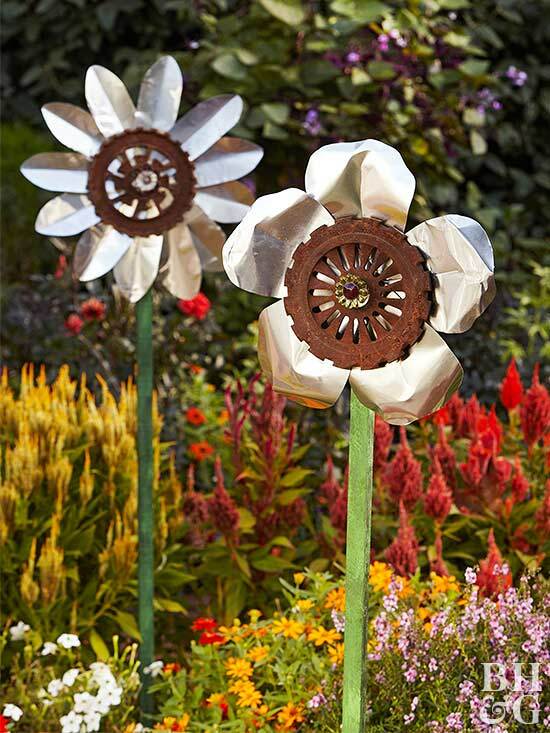 Give your garden year-round blooms with larger-than-life flowers designed from scrap metal and wooden stakes. A decorative knob provides a pop of color at the center of each flower while keeping the parts together. 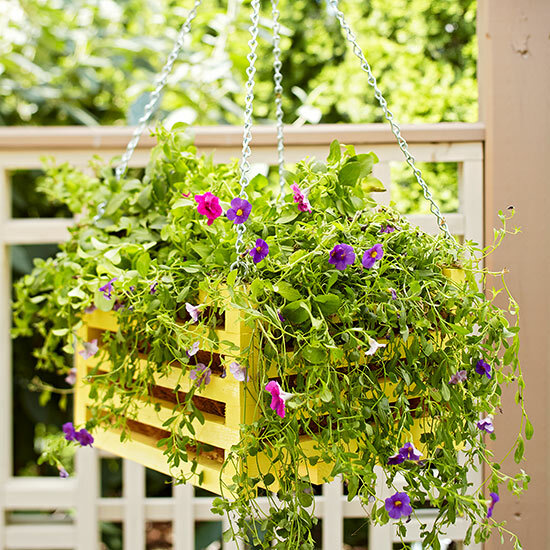 Catch eyes from a block away with a colorful hanging basket design. This easy-to-make project brings a touch of greenery straight from the garden to your front porch, patio, or deck. 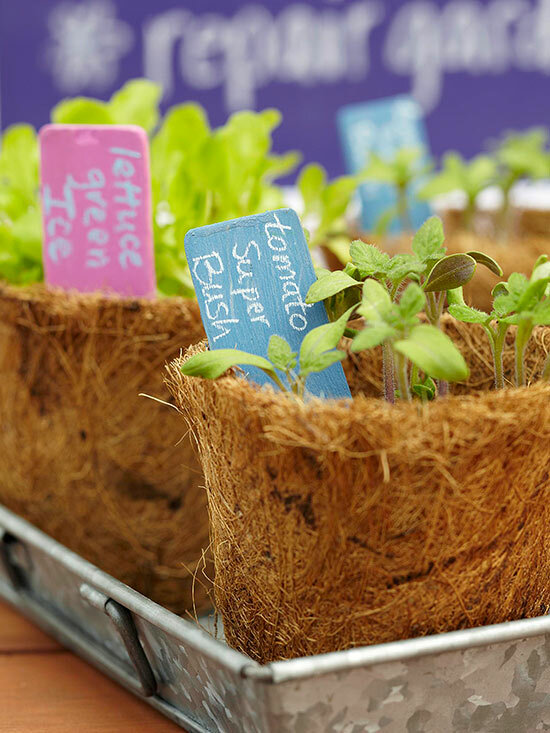 Upcycle bumper crops of plastic nursery pots and cell packs into pretty garden decor, no matter their shape, size, or color. 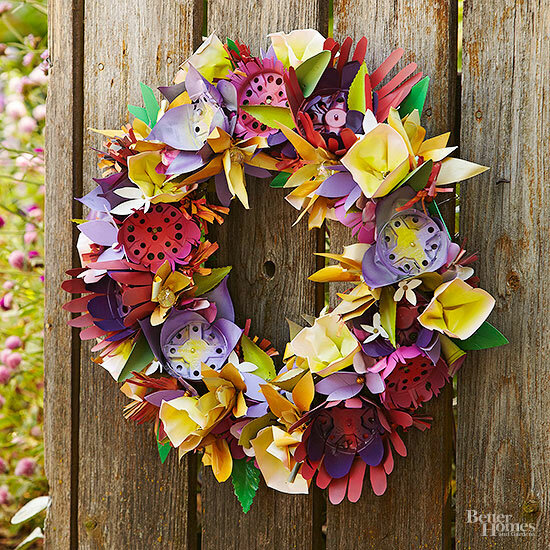 This wreath is designed to tough it out in the rain or sun. To make this wreath, set a wreath form on a moss mat and cut around it as widely as possible Glue the moss mat to the wreath form, then cut nursery pots and cell packs into desired flower shapes. Spray-paint the plastic flower shapes and let dry before anchoring each one to the wreath with florist pins. Gather leftover trimmings from pruning and fashion them into a decorative garden accent. 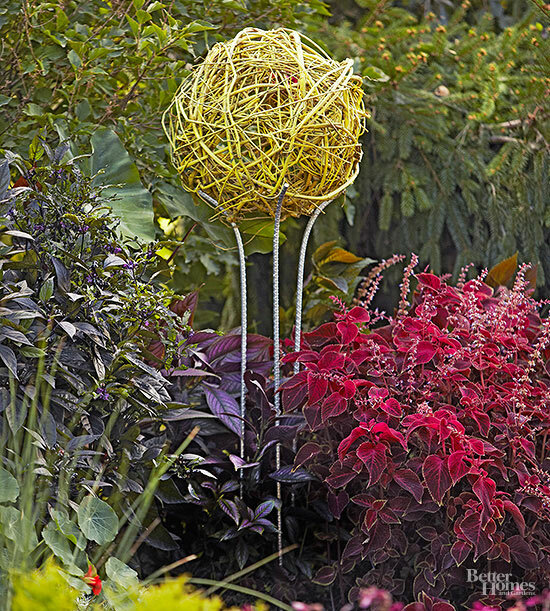 A tripod of arching rebar holds this organic sphere and adds to the scupture’s overall appeal. Insert the rebar securely in the ground 6-8 inches apart and adjust to hold the sphere. 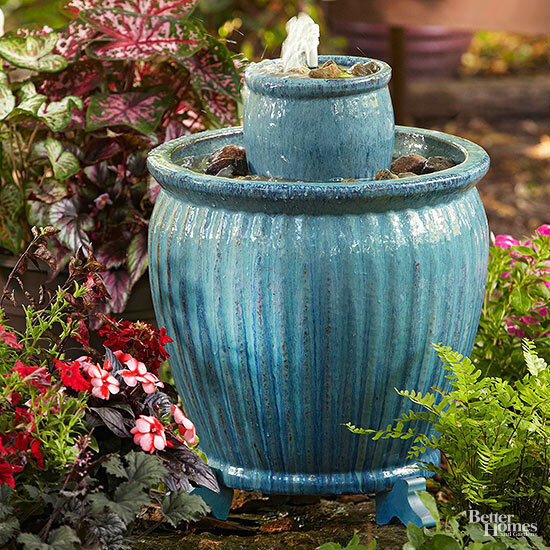 Incorporate nature’s splashy sounds into your outdoor space with a simple two-tier fountain. This space-savvy design can turn even the tiniest garden into an exotic escape. Liven up your garden with these reusable plant markers. Create your own custom chalkboard paint colors by combining 1 tablespoon unsanded tile-grout powder with 1/4 cup outdoor paint. Use the mixture to coat wooden plant stakes, then label each one with a china marker.